Zimbabwe: Did Robert Mugabe finally go too far? Zimbabwe's military says its actions do not amount to a takeover. 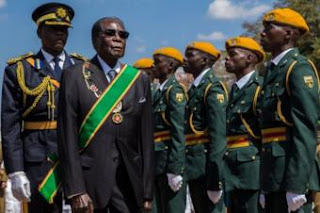 It still refers to Robert Mugabe as the commander-in-chief of the country's defence forces. But practically speaking, Mr Mugabe is not in charge if his forces can step in to usurp his authority. This is not a coup d'état in name, but it appears to be in action. The military takeover of the national broadcaster, the presence of troops on the streets and major access points, and even forced entry into the presidential palace are traits of a military takeover - at least as we have seen them in Africa. One thing that is lacking is that the constitution has not been suspended. The cementing of democracy across Africa has led to a general regional and continent-wide aversion to violent takeovers of government Even in the past, coup-stagers often promised a quick handover to civilian government through elections or a negotiated transition. Moody’s Investors Service (Moody’s) has downgraded to B2 from B1 the long-term local currency deposit and issuer ratings of four Nigerian banks. It also downgraded the long-term local and foreign currency issuer ratings of another development bank.